Why Study Greenhouse Gas Emissions from Dairy Systems? Animal agriculture presents multiple challenges for sustainability and the dairy sector alone contributes 30% of agricultural greenhouse gas (GHG) emissions. Bioenergy systems have been implemented to reduce GHG emissions and contribute to energy independence goals, but the production of bioenergy must be done with caution to avoid the generation of additional emissions during feedstock production and harvesting. This research used life cycle assessment (LCA) techniques to evaluate the integration of dairy and bio-energy systems to address global warming. The first place for integration is the dairy feed preparation level, where potential co-products of the biofuel industry (e.g. dry distillers grains with solubles and soybean meal) can be included in the dairy ration. A lifecycle approach should be considered to evaluate changes in GHG emissions related to the production of these added dairy feeds. This is important because the embedded emissions and energy resources related to upstream processes (e.g. manufacturing of seeds, fertilizers, pesticides, and fuels) and downstream processes (e.g. transportation and harvesting) can result in added greenhouse gases. The second point where dairy and bioenergy systems can be integrated happens at the waste management level, where manure is digested in an anaerobic digestion (AD) system to produce renewable energy. Different cow feeding scenarios, management practices, and anaerobic digestion pathways are modeled to identify practices that minimize GHG emissions at the dairy farm. 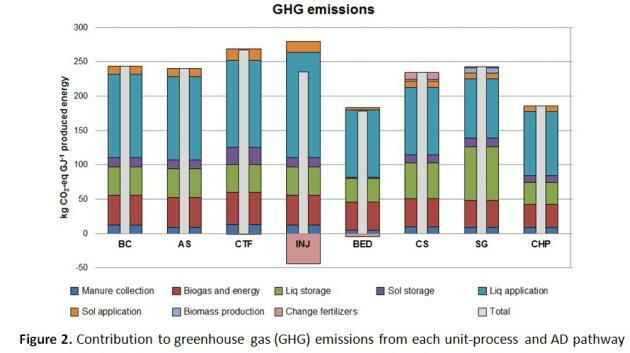 The effect of integrating bioenergy and dairy systems on GHG emissions was evaluated. First, a reference milk-producing system representative of Wisconsin (WI) was modeled using a partial LCA approach from cradle-to-farm gate. To integrate bioenergy products to the modeled farm, the boundaries of the system were defined and included corn and soybean production for ethanol and biodiesel, respectively. This was necessary in the analysis since co-products dry distillers grains with solubles (DDGS) and soybean meal (SBM) are part of the dairy diet in numerous farms of WI. In addition, the production of biogas through anaerobic digestion (AD) from the collected manure was evaluated as a second opportunity to integrate bioenergy systems with dairy systems. Given that this integrated system is multi-functional (producing milk, meat, ethanol, biodiesel and biogas); the GHG emissions were assigned to milk by system expansion, a method recommended by the International Organization for Standardization (ISO) to assign the environmental impacts of multi-functional systems among co-products. This method can be applied when a co-product clearly replaces the production of an external product (in our paper ethanol replaces gasoline and biodiesel replaces fossil diesel). Results indicate that GHG emissions for the reference system are 1.02 kg CO2-eq per kg of milk (corrected for fat and protein (FPCM). When analyzing the integration of ethanol and biodiesel (and after applying system expansion) GHG emissions are reduced to 0.86 kg CO2-eq per kg of FPCM in a diet that maximizes DDGS. The installation of a digester further reduced GHG emissions to 0.63 kg CO2-eq/kg FPCM, highlighting the importance of this system to achieve both energy and climate change goals. Given the important role that AD systems have to reduce greenhouse gases, we explored different AD scenarios based on manure management practices, co-digestion strategies, and energy conversion processes in order to achieve further emission reductions. AD is the main focus of this part of the study; therefore, a new functional unit was defined as 1 GJ of produced electricity. A base-case pathway was compared against seven alternative AD pathways. In the base-case, manure is collected with a skid steer, digested in a plug-flow digester, biogas is used for electricity production without heat recovery, and digestate is separated in a screw press and land-applied by surface broadcast. The alternative AD pathways are defined in Table 1. For the base-case, GHG emissions are 243.3 kg CO2-eq/GJ of produced energy. Results show that the AD pathway has a substantial influence on the estimates of environmental impacts and GHG emissions range from 178 to 267 kg CO2-eq/G J of produced energy (Figure 2). The dairy industry will continue to dominate agricultural activities in WI for the foreseeable future and the emerging bioenergy industry will need to be integrated into existing agricultural systems. 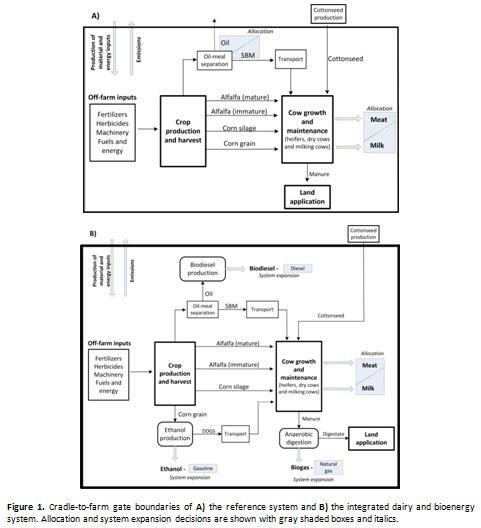 System models like this one have potential to help farmers and policy makers identify synergies between dairy production and renewable energy development. GHG emissions of a reference dairy system representative of WI are compared to a system that integrates dairy and bioenergy production. Diet scenarios that maximize DDGS content are the most effective in reducing GHG emissions. Reductions in GHG emissions come mainly from the credits of avoided emissions and primary energy from displaced fossil fuels after system expansion. GHG emissions are further reduced when implementing AD to process the manure generated in the farm. The second part of the study focused on improving the sustainability of AD systems by evaluating different manure management practices, co-digestion strategies, and energy conversion processes. GHG emissions can be reduced 31% by management practices alone, 24% if heat from the electricity generation process is recovered, and 4% by co-digesting manure with corn stover. Replacing sand with digested solids for cow bedding contributes to reduce GHG emissions as it avoids the manufacturing of this resource. Co-digesting corn stover with manure is an effective strategy to reduce GHG emissions as this feedstock requires only harvesting as opposed to switchgrass that needs to be added to the already existing crop mix requiring additional planting as well as harvesting. Finally, results show the major improvement in GHG emissions when heating the digester with recovered heat from the generator, highlighting the potential of this pathway to reduce environmental impacts without adding major technical or economic challenges to the farmer. There is potential to expand the current analysis by using the survey data collected as part of this study. For example, it would be interesting to compare management practices coming from small and large dairy farm operations. We still need to develop our knowledge on the sustainability impacts of co-digesting manure with other waste streams, such as cheese whey and whey permeate. These pathways can provide useful information to dairy processing plants about alternative uses of whey as an energy source with and without protein separation, which could be a decisive factor when making investment decisions. It will be important to quantify other environmental services of AD systems, such as water quality preservation and odor reduction. The authors are solely responsible for the content of these proceedings. The technical information does not necessarily reflect the official position of the sponsoring agencies or institutions represented by planning committee members, and inclusion and distribution herein does not constitute an endorsement of views expressed by the same. Printed materials included herein are not refereed publications. Citations should appear as follows. EXAMPLE: Authors. 2015. Title of presentation. Waste to Worth: Spreading Science and Solutions. Seattle, WA. March 31-April 3, 2015. URL of this page. Accessed on: today’s date.